Did you know that I really love pizza? I love it too much, I must’ve been Italian in one of my previous incarnations! That is why I guess it was serendipitous that the jeepney driver stopped right in front of this pizza store in Tabang over the weekend. We made plans to go to Puregold earlier so that I can buy some stuff, but decided to go check this out, instead. I am guessing this place has just recently opened as I’ve never seen this in this side of town before. Calda Pizza’s has a clean and pristine air about it. It sure is a small place and it was a welcome break that the owner did not clutter the place with unnecessary items. Apart from the four big tables and the long chairs that almost crowded the entire store, the wall is empty apart from the pizza cartons glued onto it. A nifty decor and a handy guide for those ordering for the first time. Right in front of everyone is the counter/kitchen, with the delectable pizza ingredients, an insanely huge amount of cheese weighted out at the weighing scale, and a front-row view so you can watch the crew as they create the beautiful pizza. To say that it is delectable is an understatement. 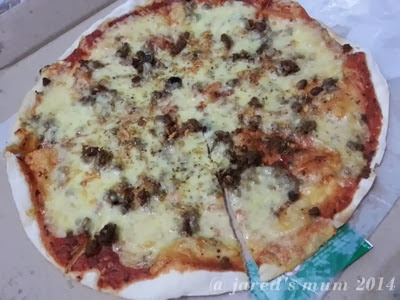 The thin-crust pizza is just everything I want in my pizza with all the generous amount of cheese, the hint of roasted garlic and oregano, and the meaty goodness of ground beef. For Php230, I’d say it is a good buy, especially when 3 grown ups enjoyed the wonderful meal. This entry was posted in comfort food, foodie finds and tagged pizza on 13.January.2014 by admin. Drooollll. The way you described the pizza keeps me drool and seems like a really delicious pizza. 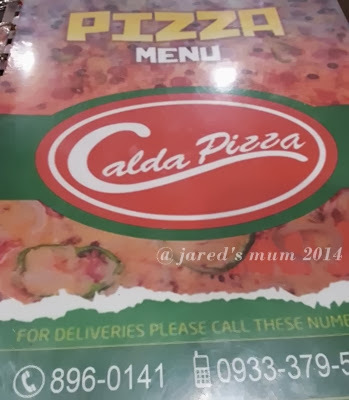 Im a pizza lover too and I wish Calda Pizza is near to my place 🙂 do they have other branch? Im from Marikina, really want to try it. It sure is! 😀 They actually have a branch in gems world, circumferential road, antipolo city, is that near your place? Pizza are great comfort food but have to eat not so often. very fattening. Num Num Num! I love pizza too, but we live far from a pizzeria. I rarely buy the frozen kind, but whenever we don’t get to go to the pizzeria, I just grab one of them boxes and bake in the oven. We all love pizza in this house. Calda sounds like a great pizza. it sure is! it is sad that you are away from a pizzeria, hopefully you can find one nearby so you won’t have to settle for the frozen one! Who wouldn’t love pizza? They are good and yummy. I like to eat it once in a while too. That pizza indeed looks yummy! My husband like any kind of pizza, this si something that would be good to try. anyone who loves pizza will definitely like this! All should try Calda Pizza. But definitely you should try the Calda Pizza Guiguinto, Bulacan. Whoa! Must try this. Sa may Puregold lang pala ito. Hihi! Especially when you tried their Hawaiian. The pineapple chunks still burst when you chew it. Especially when it is hot!